Two of the JNU students accused in the sedition row - Umar Khalid and Anirban Bhattacharya - surrendered before the police late on Tuesday night. Former members of the dissolved Democratic Students' Union, Khalid and Bhattacharya were the main organisers of the event on 9 February in which anti-national slogans were chanted. "Friends, this is to inform you that Comrade Umar and Comrade Anirban have surrendered themselves to the police. It's a moment of sadness for the campus, because we have seen these activists for years standing with the students. However, they have placed their faith in the law and we hope that they will be released soon. We also hope that Comrade Kanhaiya gets bail tomorrow," JNUSU vice-president Shehla Rashid posted on Facebook. "Falsely accused, forced to endure this nightmare. Rss stooges in the jnu admin will have to pay a v heavy price," G Arunima, a professor at the Centre for Women's Studies, tweeted in response to their surrender. 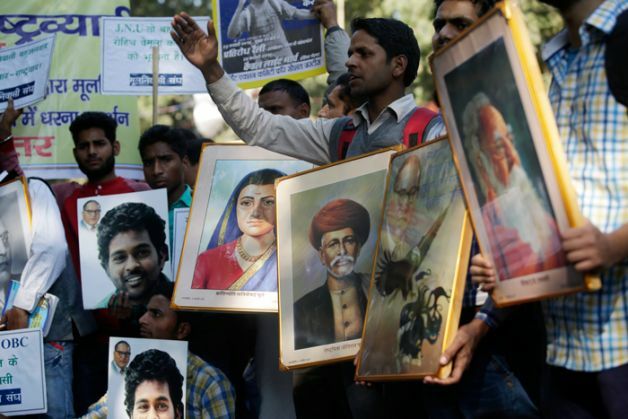 Earlier on Tuesday, thousands marched in support of another young student who was labelled an anti-national, before he chose to end his life - Rohith Vemula. The march - titled Chalo Dilli - was organised by the Joint Action Committee (JAC) for Social Justice. It symbolically began from the statue of BR Ambedkar at Ambedkar Bhavan and ended at Jantar Mantar. The trademark Left slogan of Lal Salaam made way for Neel Salaam. Prakash Ambedkar, former MP and grandson of Bharat Ratna Dr. B.R. Ambedkar gave a strong voice to the march. As did the benign presence of Rohith Vemula's mother and other family members who had arrived yesterday all the way from Hyderabad. 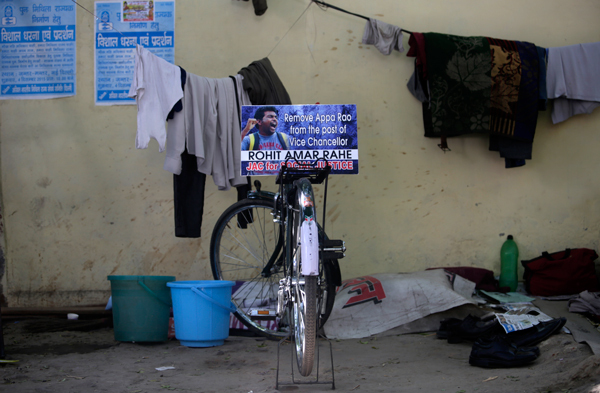 In the entire Rohith Vemula episode, the BJP came to be seen as extremely anti-Dalit. 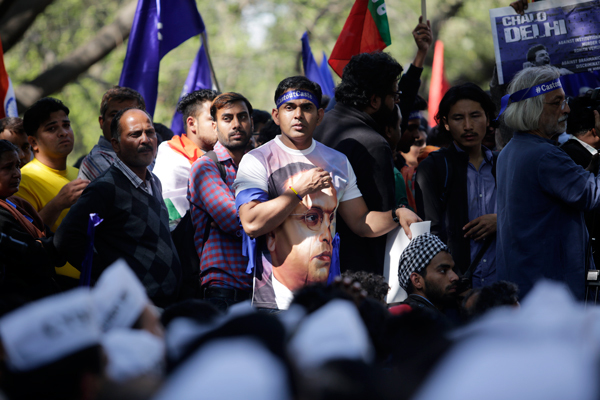 The participants of the march feel that the entire sedition row in JNU is nothing but the BJP's attempt to break the Rohith Vemula protests and to deligitimise student activism in general. 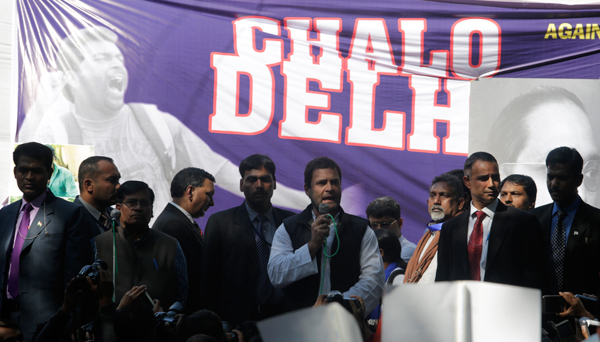 The Chalo Dilli march was therefore an attempt to reassert the convergence of Dalit, Left and progressive voices. Delhi chief minister Arvind Kejriwal and Congress vice-president Rahul Gandhi also addressed the rally at Jantar Mantar. Passing of a 'Rohith Act', on the lines of Nirbhaya Act to ensure legislative protection for students from marginalised communities in higher educational institutions. Punish the culprits Smriti Irani, Bandaru Dattatrya, Hyderabad University VC Appa Rao and other officials like Ramchandra Rao, Alok Pandey and Susheel Kumar. Drop the false police cases against the five research scholars. Appoint a special public prosecutor in the concerned case of Rohith. "After the events in Hyderabad, I suggested we needed a law for universities to end discrimination, Rohith talked about future of India, but RSS doesn't support that but only support talking about past. We do not want an India where one person's ideology is forced on everyone"
"There is a need for a law which does not let students' voices in colleges and universities be stifled." "The universities are being encroached upon and the country needs a law that doesn't stifle the students' voice." "This government seems to be at war with the students of this country. They have the right to speak...We have the right to raise our voice against anything which is wrong." "Modiji don't mess with students. If students get together, they will shake up your chair in such a manner that you will not forget." "Across the country, students are protesting against the anti-Dalit and anti-student policies of this government. Throughout the country institutions are under attack. "These protests will intensify in the days to come. Students will react in large numbers and the government will have to relent in giving justice to Rohith Vemula. The fight will be on till then." "The youth are showing us the way and that is how it should be. The various protests that took place all of last year - we were told that after the Bihar elections they would stop. But they have only strengthened. They're talking against caste discrimination and the manufactured discussion around patriotism. These are not some elitist clubs of youth, but young people that represent this country through all it's diverse forms. Let's follow them and the imaginative measures they have come up with." "The student movement is taking off after a long time. The kind of stiff broad based resistance that the JNU students and teachers showed against the assault on democracy is commendable." The government has created such an atmosphere that the voices of students across the country from FTII to JNU to HCU are being systematically suppressed. The way they are taking over faculty and administration across all universities, they are trying to impose their ideology on the rest of the country. CYSS wants to send this message: all student's are united and the government will have to pay for this if they don't change their ways." We are actively participating in the JAC to demand justice for Rohith Vemula. The Dalits, Minorities and Backward Classes are suppressed in this country and are one in this. Around two hundred Muslim students have come from Kerala for this march. We will strike continuously until our demands are made to enact the Rohith Vemula Act. "This has become one of the major oppositional forces to the present government. 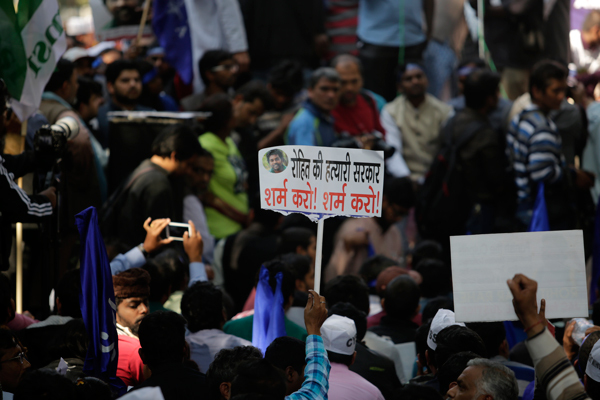 Two union ministers and the ABVP have been 'implicated' in the 'murder' of Rohith Vemula. The government is doing it's best to twist the events at JNU and Press Club to divert attention from Rohith Vemula. The broader democratic forces are coming together in a big way." "The government is tactically retreating at one level and strategically going forward at another- whipping up Brahmanical unity and unity of anti anti-nationals. The fact is they think they're on a good wicket. But the fact also is, that major sections of the population are moving away from the BJP." "Today, elite institutions like JNU. HCU and DU are coming in a confrontationist position with the state. The section of the ;intellectual' and elite left who are feeling left out - like Romila Thapar-- are trying to grab their own self interest back. They were characterised as the left upper caste mafia by some. We don't know to what extent this is a genuine alliance with Dalits. That is yet to be seen"
1. NSUI Students are protesting in support of Rohit Vemula. "Kitne Rohith Maaroge, Ghar Ghar se Rohit niklega"
2. Buddhist Monks joined the protest to show their solidarity with Rohit Vemula. This country belongs to Buddha despite of that we are talking about caste. 3. Student come from Bihar to Jantar Mantar in support of Rohit Vemula and Kanhaiya.